Big Idea Day is an event in the fall that offers graduates the opportunity to meet and engage in a discussion on a topic that affects our lives and which may be related to a current event or issue on campus at The Mountain School. Each year's topic is generated by the Alumni Committee in collaboration with the Mountain School. Big Idea Day events are hosted by alumni volunteers across the U.S., U.K., and occasionally in other countries. An online video chat discussion may be possible for alumni who don't live near other graduates. ​Big Idea Day is an event in early to mid-October that offers graduates everywhere the opportunity to meet each other and engage in a subject that affects our lives and which may be related to a current event or issue on campus at The Mountain School. Each year there is a different discussion topic, generated by the Alumni Committee in collaboration with the School. 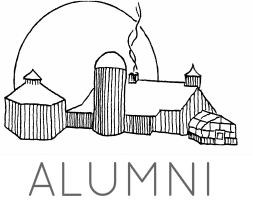 Alumni volunteers host gatherings in their homes, at cafes, in public parks, or wherever they'd like. Some Big Idea Day groups are just a few graduates, while other events have had as many as 25 attendees. Either way, the discussions are always enlightening, lively, and help alumni to connect with each other and what is happening in the world and at TMS. For Morning Meeting at the Mountain School, students rotate through the job of updating the community about current events in the news. During a recent semester, one student chose a particular story and relayed the details through the lenses of several different news sources. The story varied notably from one news outlet to another. Today, how we consume the news and which sources we choose have changed significantly since most graduates' time at the Mountain School. While we have greater access to worldwide news than ever before, how we consume it—which version to believe, how to make sure we're not staying within an echo-chamber—is more challenging than ever. For Big Idea Day 2017, the Alumni Committee invites graduates to gather and discuss how you consume news in this hyper-partisan world, where bias influences everything. Below are some questions provided to help guide conversations. How have your sources and approaches to consuming information evolved? Have you tried to limit or expand the breadth of perspectives you’re exposed to? If so, how and why? What responsibility do we have, if any, to seek and incorporate a range of perspectives and viewpoints in our news feeds? Can you avoid the news today? If yes, what are the tradeoffs? ​The Mountain School aspires to be a place where everyone belongs, where every student can say, This is my place; I am my full self here. In recent years, the School has made concerted efforts toward that aspiration. This fall’s group of 45 students includes 19 boys and 26 girls; 37 different schools, 18 of which are public schools; 16 states plus England; nine students of color; and 18 students on financial aid. The program emphasizes honesty, respect and inclusiveness, motivating students to build a community in which they are engaged and to which they are integral. And yet, for a variety of reasons—socioeconomic status, race, religion, mental health, gender, sexuality—it is more challenging for some students to belong than it is for others. Some may feel they never quite fit in. Creating a sense of belonging requires work. Part of that work is managing the delicate balance between encouraging free speech and creating safe spaces for everyone. Many schools and colleges across the United States, including the Mountain School, are trying to figure out how to protect their students within a culture that is intellectually open. For Big Idea Day 2016, we invite graduates to discuss the work of belonging, and the challenges of balancing free speech and safe spaces. How much should language be restricted in order to protect people? How does free speech or the idea of safe spaces contribute, or not, to an environment that supports belonging and community? What does it mean for the Mountain School to be a safe space? Are the ideas of free speech and safe spaces mutually exclusive? Mountain School alumni often speak of a unique kinship. We are linked by a place, but more importantly, by the values and principles that guide that place. For many of us, those values and principles informed our choices when we left Garden Hill. For Big Idea Day 2015, we invite alumni to discuss what values they have kept from their semester, and the challenges they have faced incorporating and maintaining aspects of TMS in their lives. Is TMS a part of your life in the way you envisioned it on your last day as a Mountain School student? The Mountain School strives to be a place where students of increasingly diverse backgrounds learn and thrive on equal footing. Yet, as we all know from our own semesters, subtle and not-so-subtle markers of wealth have been present on the campus since the beginning: stories about summer camp and ski vacations, the high-tech winter jacket, care packages from LL Bean and J.Crew. Some students from recent semesters have sent themselves packages using Amazon's two-day delivery to Vershire (and a parent's credit card). Such markers--or lack thereof--broadcast students' means in different ways, creating lines of division. Increasing wealth disparity in America has hit the Mountain School, and differences in socioeconomic status can lead some students to feel as if they don't belong. In fact, the middle class has begun to shrink among Mountain School students. Sixty percent of families pay full tuition, which is higher than ever ($25,660! ), and the remaining 40% of students receive more financial aid than ever before (the median grant this fall is $23,400). One-third of students come from public schools, and an increasing number of students are the first ever to attend from their high school. Several students this fall will be the first in their family to attend college. This is an opportunity for alumni to discuss socioeconomic and access issues in our daily lives. From this, we can brainstorm how the Mountain School can bridge the wealth gap to improve the inclusion of all students and how we can broaden access within our own communities and networks. What were the unspoken markers of status/access during your semester? Did you ever feel like you didn't belong because of such markers? Did you have a sense that any semester mates might have felt similarly? What would have helped them or you? This is more than a conversation about bank accounts. This is about recognizing silent lines that divide us and determining how we can leverage our own levels of access to form more inclusive neighborhoods, communities, and Mountain School semesters. Big Idea Day 2013: Gender in America in 2013: Where are we now? How do Mountain School alumni think about gender, and how does it affect their lives? We'll address and give feedback to the faculty on several questions of direct interest to the Mountain School. Big Idea Day 2012: Technology: Who's the Boss? How are TMS graduates using/coping with technology in their lives, and towards what ends? Alumni will also consider four proposed versions of a new Cell Phone Policy at TMS, which the school would like to have in place before cell phone service actually reaches Vershire.